If your holiday has been ruined by illness in Tunisia in the past 3 years, you may be entitled to make a claim for compensation. Here at HolidayIllnessClaims, our legal experts have already helped holidaymakers claim £100,000s of pounds in compensation after outbreaks of sickness in Tunisia. If youve fallen ill on a package holiday in Tunisia it is not too late for you to make a claim and receive the compensation you deserve. If your holiday has been ruined by any of illnesses above, you could be entitled to bring a claim against your tour operator. Tunisia is a well-known holiday illness blackspot. You can read more about claiming for an illness whilst on holiday in Tunisia online. Do you have a legal right to make a claim? As long as your holiday was booked as part of a package in the past 3 years, the holiday will fall under the Package Travel Regulations 1992. This means that if you have suffered an illness caused by poor food or hygiene standards your tour operator will be liable and you can bring your claim right here in the UK. We have helped thousands of people claim the money they deserve. If you believe you may be entitled to make a claim for illness in Tunisia, speak to the expert solicitors at HolidayIllnessClaims. Our dedicated team will quickly offer advice on whether you can make a claim and give you information on how much your claim could be worth. 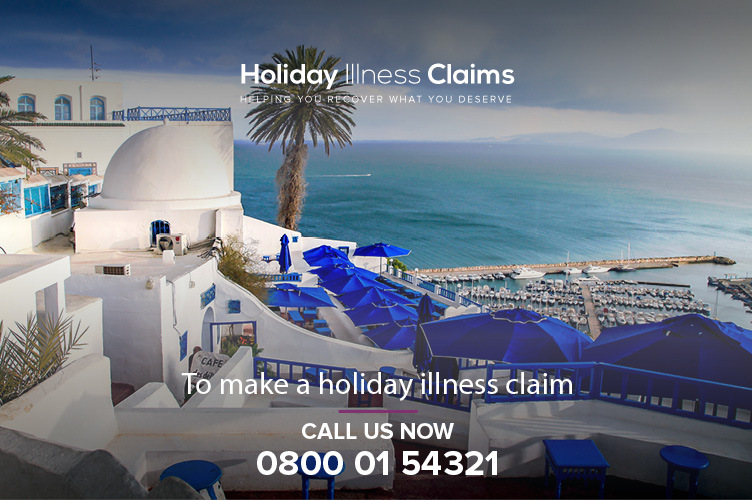 To speak directly to one of our holiday illness claims specialists, call us now on 0800 01 54321. Or, if youd prefer to arrange a call back with a member of our team, you can complete our online contact form.